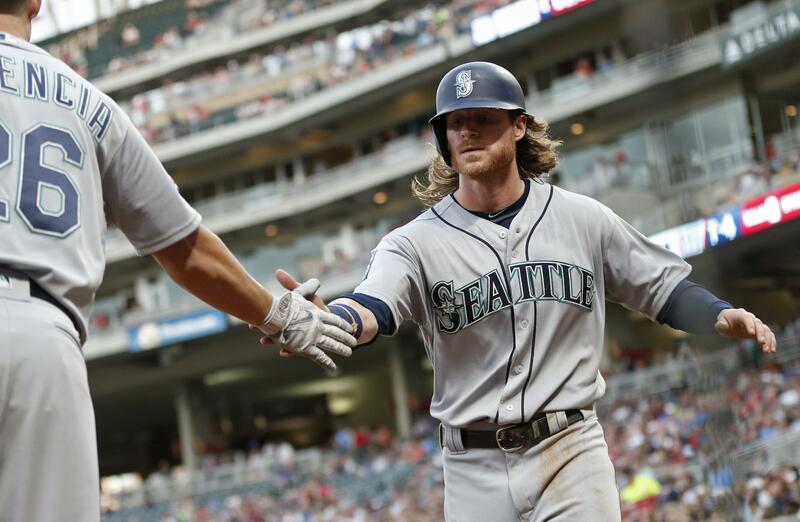 UPDATED: Tue., June 13, 2017, 4:23 p.m.
What happened: Mitch Haniger went 4 for 6 and Nelson Cruz collected four RBI, and the Seattle Mariners delivered a 14-3 rout of the Minnesota Twins in the first showing of a four-game series on Monday in Minneapolis. Haniger drove in a pair of runs against the Twins with a long shot to center field that bounced over the wall. The ground-rule double sent home Guillermo Heredia and Tyler Smith and put Seattle back on top, 4-2. Danny Valencia and Mike Zunino stretched the Mariners’ lead to 12-3 with back-to-back solo home runs in the eighth. Nelson Cruz nearly grabbed another home run for the M’s in the ninth, but officials ruled the long shot that bounced off the top half of the wall a ground-rule double. The hit still drove in a run, giving the Mariners their final score of the night. The Mariners delivered 19 hits at Target Field, and they held Minnesota to seven. Seattle right-hander Yovani Gallardo (3-6) struck out five batters and scattered seven hits across six innings. He earned all three of Minnesota’s runs. Monday night’s game was the first of a seven-game road trip, which includes a three-game series against the Texas Rangers beginning Friday. OF Ben Gamel led off with a walk and Mitch Haniger reached first base safely on an error. Nelson Cruz sent them both home on a single. Not a bad way to start the road trip. Minnesota’s Brain Dozier doubled on a deep fly to the right-field corner in the bottom of the first. Yovani Gallardo handed Dozier third base with a wild pitch just before walking Robbie Grossman on a 3-2 count. Joe Mauer drove them home on a line drive to left field to even the score at 2. The M’s answered immediately. They loaded the bases on three singles with one out. Haniger launched a shot to deep center field that hit the track and bounced over the wall for a ground-rule double, sending in two runs. Robinson Cano singled to second base and Cruz flied out to right field to grab an RBI apiece and put the Mariners up 6-2. The M’s pick up four more singles and a walk in the fourth to give them a seven-run lead, 9-2. Grossman hit a blooper back to Gallardo, and the Mariners tossed out runners at second and first to complete a double play and hold Minnesota to two runs heading into the sixth. 1B Danny Valencia got the Mariners’ score to double digits after sending home Cruz on a sacrifice fly to right field. The M’s weren’t quite finished. Valencia and Mike Zunino hit back-to-back homers in the top of the eighth inning to extend Seattle’s lead to 12-3. In the ninth inning, Cruz smacked a pitch to deep center field that bounced near the top of the wall and fell back into the park. The hit was thought to have bounced off the top of the wall for home run, but after review, officials declared the hit a ground-rule double. Cruz still picked up an RBI to damage the Twins further with a 14-3. A balk and a wild pitch by closer Steve Cichek got Minnesota’s Kennys Vargas in scoring position at third in the bottom of the ninth inning, but the Mariners put an end to the Twins’ last bit of hope with Haniger’s catch in right field for a third out. Hero: Mitch Haniger. 4 for 6, including a double that bounced over the wall in center and drove in two runs. Goat: Adalberto Mejia. Earned eight runs in 3 2/3 innings. Seattle Mariners (32-33) at Minnesota Twins (32-28) on Tuesday at 5:10 p.m. at Target Field. RHP Christian Bergman (3-3, 4.03) vs. RHP Kyle Gibson (3-4, 6.52). Published: June 12, 2017, 10:13 p.m. Updated: June 13, 2017, 4:23 p.m.